Bernese Mountain Dog Characteristics: The loyal and dependable Bernese Mountain Dog is a breed of large dog classified as a member of the Working Dog Group (AKC:1937). The Bernese Mountain Dog, is characterized by its sturdy, striking appearance with a flat, slightly furrowed head and confident, alert expression. Other characteristics include dark, almond-shaped eyes; medium sized, flat, triangular-shaped ears; a compact back and an even balanced gait. The temperament of the Bernese Mountain Dog can be described as Faithful, Affectionate, Intelligent. The coat type of the Bernese Mountain Dog is described as smooth, thick, long coat in black and white colors. Due to its characteristics and qualities, the Bernese Mountain Dog demonstrated the desired traits of a Watch dog, Herding and droving dog and is known by its nick name the "Berner". The origin of the Bernese Mountain Dog breed was in Switzerland where it was developed in the Roman times. Bernese Mountain Dog Breed Group and Type - Working Dogs Group (AKC:1937): The Bernese Mountain Dog is one of the many breeds of dogs that belong to the Working Dogs Group (AKC:1937). Other names for the Bernese Mountain Dog: The Bernese Mountain Dog is known by the nickname of the "Berner". Other names for this breed include "Cheese Dogs", Berne Herdsman's Dogs, Durrbachler, Berner Sennenhund, Bernese Cattle Dogs and Alpine Pasture Dogs. Origin of the name: The origin of the name "Bernese Mountain Dog" derives from its place of origin in Berne, Switzerland and its role as an Alpine mountain dog. Bernese Mountain Dog History and Origin: The country of origin of the Bernese Mountain Dog breed was in Switzerland and dates back to the Roman Empire over 2000 years ago. The ancestors of the Bernese Mountain Dogs were believed to be molosser-type dogs that were used as watchdogs acting as sentries for the Roman Legions and to protect and control livestock. The Romans conquered Switzerland around the 2nd century BC and their dogs were interbred with local cattle dogs and sheepdogs in the Alpine village settlements. These ancient dogs were called 'Sennenhund' in reference to people called Senn or Senner, the names given to the Swiss alpine herdsmen. 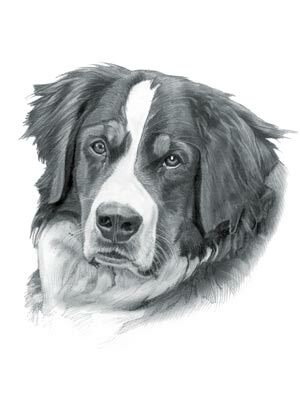 There were four, well known Sennenhund breeds in Switzerland: The Berner Sennenhund (Bernese Mountain Dog), the Grosser Schweizer Sennenhund (Greater Swiss Mountain Dog), the Appenzeller Sennenhund (Appenzeller) and the Entlebucher Sennenhund (Entlebucher Mountain Dog). The 'Berner Sennenhund' were the Bernese Mountain Dogs that were found across the Berne canton (region), which was established as part of the Old Swiss Confederacy in 1353. The Bernese Mountain Dog breed became an all round farm dog working as herding and guard dogs in the pastoralist societies of the Berne region. The herds of livestock were moved by the herdsmen and Bernese Mountain Dogs according to the season from the higher pastures in summer to the lower valleys in winter (this seasonal movement is known as the Transhumance). The dairy products of transhumance flocks and herds were milk, cheese, butter and yogurt. The Bernese Mountain Dogs were used as cart dogs (draught dogs) moving the dairy products around the population as a convenient, and inexpensive, alternative to the horse. At this time the breed was named the "Durrbachler" from a small town called Durrbach near Riggisberg in the Canton Berne. Bernese Mountain Dog History: The Industrialization of Switzerland during the early 1800's led to a decline in numbers of the Bernese Mountain Dog and by the turn of the century the Bernese Mountain Dog, as a distinctive breed, was in danger of becoming extinct. An innkeeper called Franz Schertenlieb was responsible for the initial revival of the breed. His work came to the attention of a Swiss professor called Albert Heim (12 April 1849 – 31 August 1937) who joined him in his work to preserve and promote the breed. A breed club was formed in 1907, a standard was written for the breed and the "Durrbachler" was renamed the Berner Sennenhund (Bernese Mountain Dog) to follow the naming convention of the other Swiss Sennenhund breeds. Bernese Mountain Dogs were shown at canine shows and exhibitions and became a great success in Europe. The first Bernese Mountain Dog was introduced to the United in 1926 by a Isaac Scheiss a farmer from Florence in Marion County, Kansas. The Bernese Mountain Dog was officially recognized by the American Kennel Club (AKC) in 1937. Bernese Mountain Dog Modern History: The modern history of the Bernese Mountain Dogs moved on and the Bernese Mountain Dog Club of America was established in 1968. The Bernese Mountain breed is still used as a farm worker but is also used in search and rescue work and as therapy dogs. The Bernese Mountain Dog is reliable and affectionate with children and is enjoyed as a family pet in rural areas with temperate climates. Bernese Mountain Dog Height: The Bernese Mountain is classified as a large sized dog. The height to the shoulder of a male is 24-28 inches (61-71 cm). The height to the shoulder of a female is 23-27 inches (58-69 cm). Bernese Mountain Dog Weight: Not surprisingly for a large sized animal, the weight of a male is 85-110 pounds (38-50 kg). The weight of the smaller female is 80-105 pounds (36-48 kg). Bernese Mountain Dog Coat Type: The coat type is described as a smooth, thick, long coat. Bernese Mountain Dog Coat Colors: The colors of this breed include black, white and rust colors. Bernese Mountain Dog Grooming - LOW Grooming Needs: The dog grooming needs of the Bernese Mountain Dog are categorized as Low in order to maintain a healthy coat and reduce the risk of skin infections. The limited dog grooming needs of the Bernese Mountain Dog are therefore considered to be low maintenance, requiring limited attention to grooming with casual brushing and combing. Dog Grooming needs should also include bathing the dog on a monthly basis and making regular inspections of the eyes, ears, nails and teeth. Bernese Litter Size: The litter size of this dog breed ranges from 1-14 puppies (average 8 pups). Bernese Mountain Dog puppies for sale can be obtained reputable breeders and from rescue centers. The cost of Bernese Mountain Dog puppies varies depending on location, pedigree history and the dog breeder. Bernese Mountain Dog Temperament and personality: The temperament and personality of this popular dog breed is described as Loyal , Faithful, Affectionate, Intelligent and Dependable. Bernese Exercise Requirements - HIGH Exercise Requirements: The exercise requirements of this breed of dog is high. The Bernese Mountain Dog requires regular daily exercise consisting of approximately one to two hours each day. This large, powerful dog has a supple, even balanced gait with strides of a moderate length and requires a brisk walking speed or jogging by the owner to meet the dogs exercise requirements. Bernese Diet: A fully grown Bernese Mountain Dog should be fed twice a day. A diet consisting of a premium dog food can be balanced with fresh food eaten by the family. The question is What Can Dogs Eat?. Check out our comprehensive list of what dogs can and what dogs cannot eat. Bernese Mountain Dog Health Problems: Potential health problems of the Bernese Mountain Dog breed include Eye problems, Gastric Torsion, Hip Dysplasia . Resolving health problems can prove to be expensive and it is always wise to obtain pet insurance or dog health insurance when buying a dog. Is the Bernese Mountain Dog breed said to be Hypoallergenic? Answer: No. Bernese Mountain Dog Lifespan: The life expectancy of dogs vary according to the size, breed of dog and any serious health problems. The typical lifespan of the Bernese Mountain Dog breed is 7-9 years. Bernese Mountain Dog Male Names: Male names are most often chosen to reflect favorite names of the owner or the strength, size, coloring and country of origin of the Bernese Mountain Dogs. To give you some inspiration regarding good male Bernese Mountain names our small selection might be of help with naming boy dogs. Our top male dog names are: Jabba *** Rugby *** Kong *** Shark *** Brawler *** Lincoln *** Jaws *** Brutus *** Mack *** Sumo *** Samson. Bernese Mountain Dog Female Dog Names: Female Dog names tend to be softer, prettier and reflect the temperament of Bernese Mountain girl dogs. Our top choice of good female Bernese Mountain names are Misty *** Rain *** Sable *** Olympas *** Persis *** Ginger *** Zia *** Molly *** Maggie *** Chloe *** Harley.